thank you Deje Selam for your update i would like to say for those our brothers who are in prisoned to released as soon as possible and all sunday school has to stand beside them. they ARE our brothers there fight was not hate to human its true that they were defending our church from those who are working with evil. please Daje Salam let us know if the are released or not? i think abune paulos if he keeps his word it will be nice for our future as he said "he is against tehadiso" even though i don't trust that word i have faith on God the time is coming no matter what. tizitawena guadegnocheh kezihe befite bebetekristian seme yesebesebachute genzebe(nibrete) yebekachuhlena menew betetewen. "ewunet ena nigat eyader yiteral"
Thank you for adding PDF format! May God bless you for all your hard work! You just made it easy for those of us who are using iPad or iPhone to visit your website. Please keep it up the good job you have been doing. Dear my Orthodex Tewahido Fathers, Mothers, Sisters and Brothers I would like to say CONGRADULATIONS to our 30th annual meeting. I have a great faith and hope that the meeting was held in GODs presence. I’m one of the devoted orthodox tewahido Christians seeking the truth in Christ. The past 20 years I’m in search of the true Shepard of the lamb, the father that carries the cross and leads me to through the narrow path. HEEEEEEEELP me? 1. In the late 1980s I was told the legal patriarch is living in exile therefore this is the church you should follow. 2. 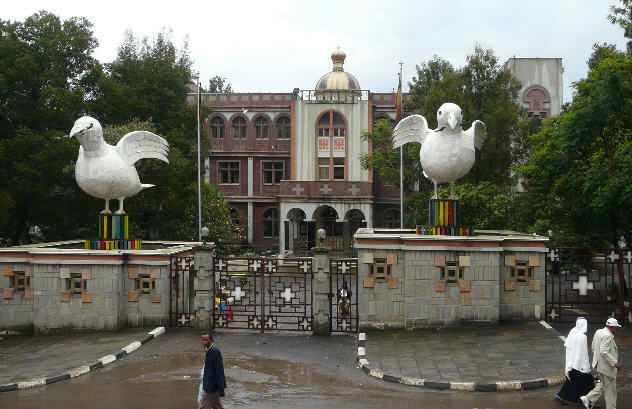 In the early 1990s I was told, no do not follow any of the church that is under either of the patriarchs, just stay in the independent Ethiopian orthodox tewahido church. 3. In the late 1990 and 2000s, I was told what ever happened until GOD answers our prayer we have to stick with E.O.T.C synods and worship GOD. The I found a father who I believe is one of the most hard working true Christian of E.O.T.C. (Abune Abreham). Because of the past sad experience in my Kennona faith, I had to carefully study Abune Abreham. He is a very hard working father who does not give value for wealth, and his own leisure. While I see some priests looking an opportunity to take advantage of living in America, I see him crossing state to state in a rental car provided to him by parishioner who loves his presence in there church. He does not want to fly by airplane or ride luxurious cars. I would like to say this truth, may be His holiness Patriarch Paulos may not like this. I was witnessed what has happened in one church that is under his administration. The church had its annual holyday. Abune Abreham was invited and he came with two other priests. At the end of the service, the church “Sebeka gubaie” write a check of $500.00 for him and $200.00 for each priest enclosed in envelop given to them. When Abune Abreham found out about the check given, he was very sad and returned the check with a promise of commitment that he is going to serve GOD our lord with out any earthly pleasure. He said, he is very sad and disappointed to hear that others his followers are taking such earthly thing. So isn’t that the type of father E.O.T.C need? Isn’t that what Christ did on earth? Isn’t this what we Christ followers want? Why fathers like Abune Abreham face the challenge that they should not have face? Please do not judge mistakenly. I just love my Orthodox Tewahido faith, beyond my faith, I have no blood relationship or any thing with Abune Abrehame. One thing I want to witness for him is the TRUE Father the E.O.T. Church needs. I’m sure there are hundreds and thousands that have the same feeling. May GOD bless our faith and show us the narrow road that leads us to him. Dejeselam .Happy birth day.By the way are you boy or girl?It is ok I won't matter.I am sure you are beautiful.I am surea a big party is gonne be outthere on the blog world. thank you for the news update. May God help our Father make a historical decision that curbs the reformist threat once and for all. Amen!